The Rule of Two (Plus One) Ken Watson from All about Digital Photos wrote a very thorough article covering storing and archiving digital photos. He states that The Rule of Two basically means you have two copies of your photos, one on your computer and one stored in another medium. It might seem obvious but its a really good idea to backup your files, that way if your computer files become damaged or corrupted you have a safe copy to use. Memory Cards as Backup. Ken Watson discusses using memory sticks as a backup system (which is what I use). A lot of my clients find this a very efficient way to store photos because they already have the disk in the camera eliminating an additional step, and the prices have dropped on memory cards making this more feasible then in the past. This might not be an optimum way to store photos because their is a cost and shelf life to memory cards as well as they are small and can get lost. (I use this Pelican Case to store my memory cards). However, there are other options available for those who don’t want to spend any money to backup your photo files. Cloud based memory storage. Many free internet options are available for storing your photos. And if you use your phone as a camera, a memory card may not be a good option for photo storage. You might find the best way to store photos is using a cloud based storage system. The Wall Street Journal published an article by Wilson Rothman on many online/cloud based photo storage systems available with all the pros and cons for each. Rothman recommends Flickr as satisfying all his requirements for automatic backup, easy uploading, private and public photo sharing options, and some editing options. With 1000 Gigabytes free storage, even the most prolific photographer will have plenty of space. I, however, use Shutterfly and Picasa. I can automatically download photos from my phone to Picasa or Shutterfly, edit and manipulate them on my computer, and back them up whenever the computer is connected to the internet. Another option that I have not had a chance to review is unlimited photo storage by Amazon prime. So if anyone has any experience with Prime Photos please comment below! Plus One. Instead of just having photos stored digitally I recommend printing them out, thus the Plus One. If you use Picasa you can select Order Prints under File in the Picasa menu, then print out the photos using Shutterfly. Storing photos on the computer, storing them in one additional storage location whether a memory card or cloud system, and printing them out, insures that you photos are safe, adequately stored/archived, and easily viewed. Tell a Story. Printing photos allows you the ability to enjoy your photos and the opportunity to curate your collection, weeding out digital photos that aren’t worth keeping. I especially like printing out photos as a book because, when put together, the pictures begin to tell a story. Shutterfly even offers to arrange your photos for you using their Simple Path photo book. Or you can customize your own book from multiple templates. No more loose photos or torn edges, creating a book makes photo storage simple. What about Prints or Old Family Photos? Single printed photos have a tendency to end up floating in drawers or cabinets. In order to preserve them I suggest storing printed photos in archival photo albums. In order to fit on a standard bookshelf I recommend an 8 x 10 size albums rather than the 12 x 12. The National Archives has a detailed article on family photo storage and recommends storing photos larger than 8 x 10 in flat archival boxes like these from Hollinger. Should I go Digital? I’ve been asked if you need to digitize printed photos. My response is, its always a good idea to have a backup. Whether its negatives stored in a safe deposit box, double copies stored in a fireproof location, or digital photos stored on a computer; having two copies is always a good idea. This article from CNET describes multiple ways to digitize photos including an app to turn your phone into a scanner. However, if you really want to go digital they recommend using a scanner for optimum quality. This is just a tiny selection of the photo storage options available. Other software programs, like Lightroom, offer many more options from computer to cloud storage and optimum editing features, to organization and sharing. 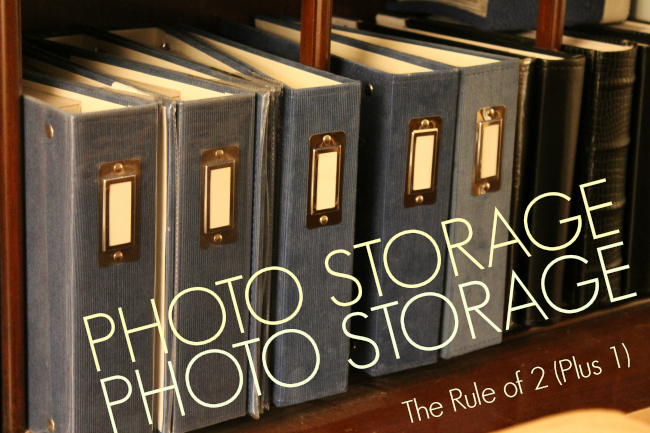 However, you don’t have to spend much to organize, store, and archive your photos. Whether print or digital, photos are meant to be viewed. If you are feeling overwhelmed by the options available start from the present day and then as you feel more comfortable begin going through past photos to bring them up to your current system. I love to hear your thoughts so please let me know if you have any questions, suggestions, or comments! This was one of my resolutions this year….that well….I started. I need to set up a schedule or pay a kid to to take on the daunting task of scanning. They are now all in one place and almost chronological…does that count?